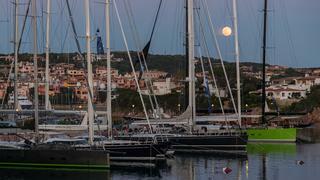 With cloudless skies and a gentle breeze blowing across the entrance to Porto Cervo, Sardinia, the 14 sailing superyachts taking part in this year’s Loro Piana Superyacht Regatta – organised by Boat International Media and the Yacht Club Costa Smeralda – will be looking forward to a sparkling first day of racing. The fleet spans a broad range of yachts, from the giant 55 metre ketch Marie and 50 metre Ohana down to the 24 metre Nahita, and has been split into three classes. Using the new ORCsy rating rule, yachts will compete in a straight pursuit race with the slowest rated yacht starting first and the rest following at calculated intervals. 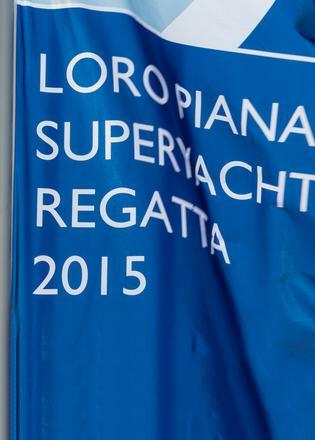 The result – as seen in the rule’s first outing at the Loro Piana Caribbean Superyacht Regatta this March – should be some spectacular, close finishes. 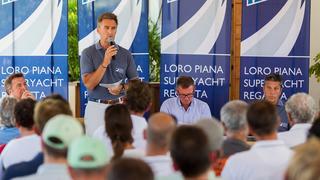 In Class A, Marie and Ohana will be facing challenges from regatta regulars Ganesha and Saudade along with Clan VIII, while Class B should see spirited competition between the 33 metre yachts Inoui and WinWin – although Pier-Luigi Loro Piana’s yacht My Song will be hoping to capitalise on the light airs to sneak through. Class C includes the Southern Wind yachts Blues, Cape Arrow and Grande Orazio, who will be taking on stiff competition from the Spirit Yachts beauty Gaia, the Wally Nahita, and the new Oyster 825 Maegan which is racing for the first time. As the fleet prepares to leave the dock, the race committee has reported better than expected conditions in the face of a forecast that many feared would mean a windless first day. Follow our live tweets throughout the day for details of the course along with blow-by-blow commentary on the racing action.